Well, it may be 2018 with hundreds of jets a day crossing the Atlantic, but it was a bit more of an adventure back in the 1950's. 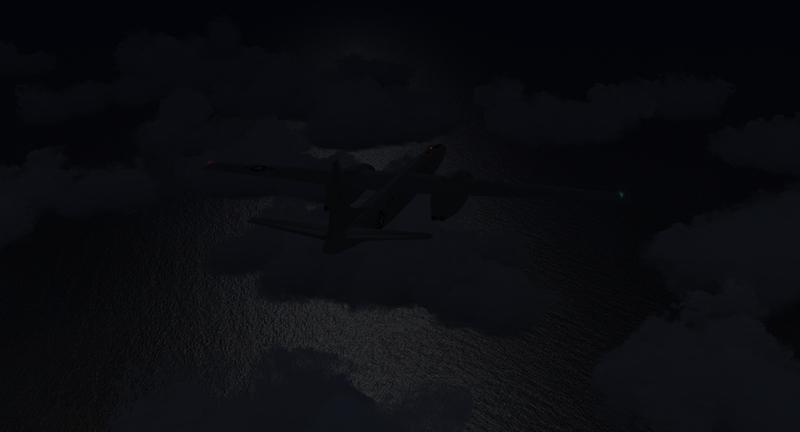 So when Moses03 suggested the holiday lull might be a good time for him to attempt a Trans-At flight in the Virtavia XB-46, I thought it would be a good idea to tag along in a B-47, take photos and, if needed, act as a 'mother hen' should a ditching be required (hey, one should think positively but prepare for the worst ). Thus it was that we assembled the crews and the equipment (add-on wx programs, Duenna, TeamSpeak) at Loring Int'l (formerly Loring (SAC) AFB). Turns out the XB-46 wasn't particularly fuel-efficient so we flight-planned to St. Magwan (EGDG) as the nearest British military airfield. with Shannon, Ireland as an alternate. Only 2460 nm but even that would require favorable winds. Departure was set for 1300 LCL - giving us a night arrival in the UK, but that can't be helped when the 'domestic' environment had to be maintained in a happy state. We were 'wheels up' at 1320 and set course for the Gulf of St. Lawrence. The nav guys had plotted a route that took us across the northern tip of Newfoundland and well south of Iceland, but far enough to the north that we made a mental note that Keflavik could be an alternate-of-last-resort. We found a quartering tailwind as forecast and things were going as planned as we passed St. Anthony, NL but we were well aware of the "Murphy Factor" and sure enough, about an hour later the winds started to drop... and drop. OK, so it's going to be close, but Keep Calm and Carry On! We also got word that a chartered B747 had departed Gander to join up with us (it's interesting to fly two a/c on two computers simultaneously - in cruise). See that little jog in the course south of Greenland? Right about there -3:20 into the flight - is when Kevin's FSX decided it would be fun to freeze up solid. First thing to go was his connection to Duenna so he lost his flight tracking. As we were in a loose formation (visual contact) I could confirm that the XB-46 had indeed paused in space-time and was frozen in the midst of a clump of contrail. The jog in the track is from my turns to orbit and stay in sight. We're hoping the warp in space-time would be mended and after about eleven minutes he declared that the world was back to normal so we pressed onward. Unfortunately the winds didn't want to pick up so about 45 minutes later we elected to divert to Shannon. Adjust course, start briefing for a new destination and watch as the winds gradually swing to the southwest and increase - but not enough to tempt us to think about St. Magwan. Six hours, 55 minutes flight time, a little over 7:25 spent chatting and enjoying each other's company. All in all, a pretty nice day! Not bad for late 1940's jet technology. The elegant XB-46 never got to show off it's capability so good to see it could have beaten the 1951 Canberra as the first non-stop/non-refuel jet across the Atlantic as early as mid 1947. Like Rob said my FSX locked up for about eleven minutes and I lost the Duenna. (Too bad the Duenna can't go on standby for about 10-15 min and reconnect for these instances). Maybe a suggestion on that to Eamonn on the RTWR forums? There's a forum just for Duenna suggestions, and he DOES read it, if/when someone posts there. Its been suggested yes, right now the Duenna goes into a standby mode for about 30 seconds when it disconnects (although that is not surprising difficult to test thoroughly so it may bug out). Putting it into long time standby is something I can do but how that effects the validity of the flight is something we'd have to figure out, also, would have to check to see if the plane has changed on reconnect or fuel levels are refueled, etc..